How to Use A Convertible Top Care Kit for Fabric | Gold Eagle Co. Feeling the wind in your face as you drive a convertible in great weather can be invigorating…but there always comes a time when you need to put the top back on your car. And as you do that, you might find that the cover is not as clean or water repellant as you’d like. After all, it’s normal for sun, rain, and hours on the road to take a toll on your car over time, and your convertible top is no exception to this. Fortunately, you have access to products made specifically to eliminate and even prevent stains and water damage on your convertible’s top. Here’s what you need to know about some of the top products for this purpose. 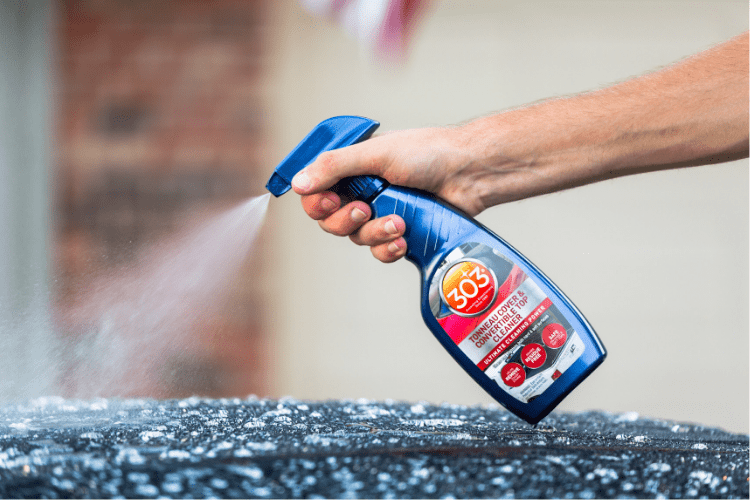 Whether your convertible top is made of fabric or vinyl, you can use 303 Tonneau Cover & Convertible Top Cleaner to get it looking as clean as possible. In fact, this product is perfect for everything from vinyl and fabric tops to tonneau covers and car bras. Basically, if there’s a delicate part of your car you need to clean and protect, this solution can do the job, all without the use of harsh chemicals that tend to leave residue behind. To get started with this product, rinse the vinyl or fabric first to remove dirt and debris right off the bat. While the material is still wet from being rinsed, apply 303 Tonneau Cover & Convertible Top Cleaner. Lightly rub it in with a sponge, terry cloth rag, or brush, like the 303 Convertible Top Brush. Then rinse with clean water. 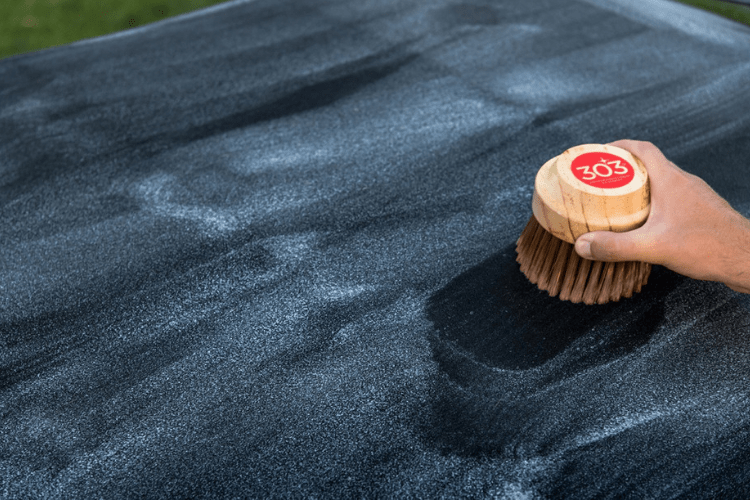 For tougher stains on the convertible top, apply the cleaner and let it stand for 10 to 20 minutes. Then scrub lightly to start eliminating the stain. Rinse before the material dries. If you’re having trouble getting a stain out, consider letting the cleaner sit longer on the material, and feel free to scrub harder. In fact, when it’s cold outside, you might need to let the cleaner sit longer than when it’s warm out, so keep that in mind as you start cleaning. Part of protecting your convertible top year round is making it harder for stains to show up on the surface. You can do that easily by applying 303 Fabric Guard, as long as you have a fabric top, as it doesn’t work with vinyl. When you use this solution on fabric, it repels water so the material doesn’t even have a chance to get water damage or attract water stains from rain. Plus, it can protect the fabric from stains and mildew. If these benefits sound good to you, it’s time to start using 303 Fabric Guard to protect your fabric convertible top. First, make sure the surface is clean and dry, and that the weather is warm and sunny if possible. Then test for color fastness by spraying an area that is hard to see, such as a small corner, and then wiping the surface with a white towel to see if any color comes off. If it does, do not continue to use this product. But if no color comes off the fabric, you can safely use this solution to protect your fabric convertible top. To do so, spray this product onto the fabric evenly, ensuring the entire surface is wet. Then let it dry for 12 to 24 hours, ensuring it doesn’t come into contact with rain or dew during that time. You can test it to make sure it’s water repellent by dripping water onto the fabric. If the water beads up, the product worked for you. If it soaks in, you’ll need to retreat the fabric. You can find these two products in the 303 Fabric Convertible Top Care Kit, or buy the 303 Tonneau Cover & Convertible Top Cleaner and 303 Fabric Guard separately. And if you need help protecting your vinyl convertible top, you can try the 303 Vinyl Convertible Top Care Kit.